Just because a card may say something like "Rookie Prospect", "Rated Rookie", or "Star Rookie" across the card, doesn't necessarily mean it's a rookie card. Conversely, if a card does not say "Rookie" on it somewhere, it may still be his rookie card. 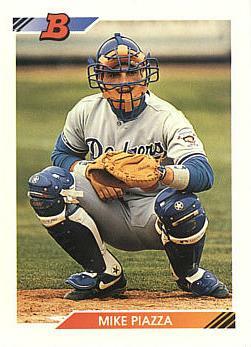 An example of a card not stating "rookie" and still being a rookie card is the Mike Piazza rookie card below. If you really want to know if a card is a rookie card or not, you'll need to ask someone who is familiar with the hobby or look in a price guide. There have been many trends in the hobby. Collectors at some point in time have collected error cards, insert cards, serially numbered cards, game used cards, etc. All of these fads have come and gone in varying degrees. However, collecting Rookie Cards has been a staple in the hobby for decades, and shows no signs of slowing down. Twenty years from now, people aren't going to care about that shiny refractor card you have, or the error card that misspells Joe Schmoe's name. But people will be in awe when you tell them you own a genuine Nolan Ryan Rookie Card, a Mark McGwire Rookie Card, or a Barry Bonds Rookie Card. You get the idea. Mike Piazza Rookie Card If you're thinking of buying baseball cards from an investment standpoint, rookie cards are the ones to own. They are usually more valuable than the subsequent cards that are released after their rookie card. For example, the 1992 Bowman Mike Piazza Rookie Card is valued at $50.00. His 1993 Bowman card is valued at $3.00, and 1994 Bowman is $2.50. Why is the 1992 Bowman so valuable? Because it is his Rookie Card. Any other Piazza card produced after 1992 is not his rookie card, and therefore will most likely never be worth as much as his rookie card. Personally, I love Rookie Cards. I love seeing how young they look compared to how they look now. My favorite examples are the Ken Griffey Jr. Rookie Card and Mark McGwire Rookie Card. They practically look like kids! Some of them attempt to look older by sporting a mustache, such as Greg Maddux and Curt Schilling, which cracks me up. So which rookie cards should you collect? Some people like to collect rookie cards of current stars that will someday be in the Hall of Fame, such as Barry Bonds, Alex Rodriguez, Albert Pujols, and watching the values of these cards rise as time goes by, or give these rookie cards as gifts to their children or grandchildren. Other people collect rookie cards of their favorite players, or players from their favorite team. Both are great reasons to collect. If you have any questions about rookie cards, feel free to call me at 978-362-8318 or email at homeruncards_com@yahoo.com. My name is Chuck by the way, and I'd be more than happy to help you with this great hobby of ours.